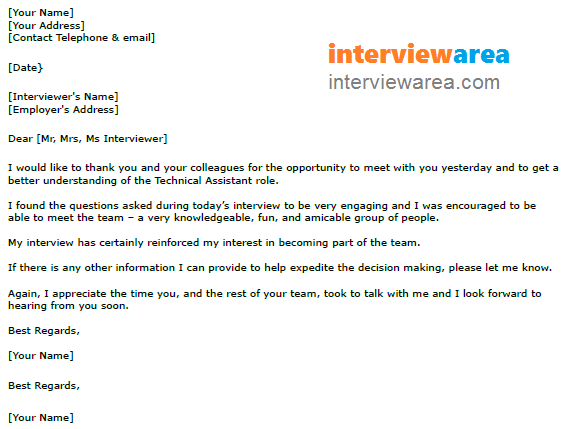 Use this example thank you letter if you want to say thank you to the employers after your group interview. Don’t forget to amend this letter before using it for your job applications. I would like to thank you and your colleagues for the opportunity to meet with you yesterday and to get a better understanding of the Technical Assistant role. I found the questions asked during today’s interview to be very engaging and I was encouraged to be able to meet the team – a very knowledgeable, fun, and amicable group of people. My interview has certainly reinforced my interest in becoming part of the team. If there is any other information I can provide to help expedite the decision making, please let me know. Again, I appreciate the time you, and the rest of your team, took to talk with me and I look forward to hearing from you soon.